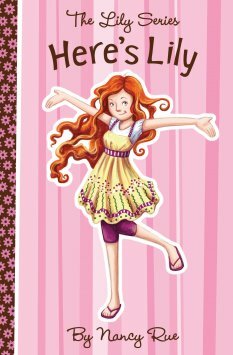 This book is about Lily, a girl in sixth grade, who’s always being teased by her brothers and the boys at school because of being tall, thin and her abundance of red hair. She’s very surprised when a guest speaker comes to their school to talk to the girls about taking care of their skin, and ends up using Lily to demonstrate on. She’s even more surprised when the lady tells Lily she’s model material, and wants to talk to Lily’s parents. Maybe Lily has finally found a way to get Shad, the leader of the bully’s, off of her back. I thought Here’s Lily had some really good points. This book teaches that beauty is more than looks; it’s also the way you treat others and the way you act and carry yourself. Most of the book did deal on appearance (I thought maybe a little too much), but had a captivating enough plot line to keep me reading it all the way through without a break. Nancy Rue has an engaging writing style that makes her books very real, easy to follow and to relate to. All in all it was a refreshing look on how to view outward appearances. There’s a lot of what I would consider bad attitudes in this book. I think that fewer bad attitudes wouldn’t have cost the book anything, and would have improved it. BookSneeze® provided me with a complimentary copy of this book, but the views are my own. If you do read it, I would enjoy hearing what you think! i've read the entire series! the best books ever!